Silchar, Apr 12 : A welfare trust of the industrial house of Tatas has signed an MoU with the Mizoram government in its rural development initiatives. 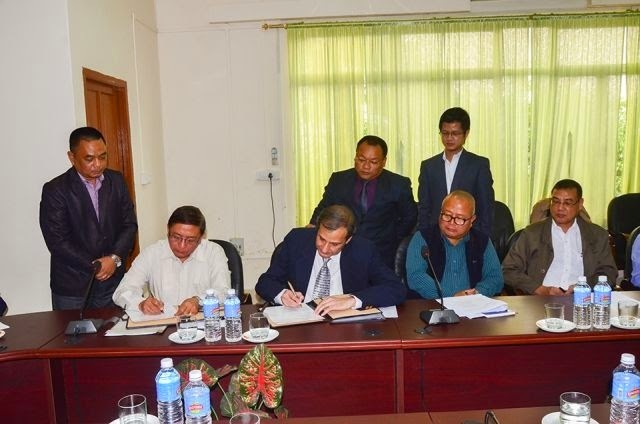 Official sources in Aizawl today said the memorandum of understanding (MoU) was initiated with Burziz Taraporevala, secretary of the Ratan Tata Trust, in the Mizoram capital on April 8. Taraporevala said the Trust would provide Rs 18.8 crore over the next five years for rural development projects under the Mizoram government's flagship project, New Land Utilisation Policy (NLUP). He hoped the joint project, which aims at economic uplift of about 17,000 Mizo families, would bear fruit. The joint project aims to uplift the living standard of the poor in the rural areas of the state by offering employment opportunities such as rearing of pigs by increasing the number of scientific pig sties, and increase in horticulture products, such as exportable fruits like orange, passion fruit and grapes and cultivation of flowers such as the anthurium. The venture also aims to discourage farmers from practising the wasteful slash-and- burn jhum cultivation on hill terraces by providing them with an alternative, profitable agricultural practice. Improvement of traditional Mizo handicraft items like knitted colourful puan (women's skirts) and jackets, and bamboo baskets and hats have also found primacy in the schemes to be executed by the NLUP grants. The NLUP, an innovative rural project of the Mizoram government, was unfurled in 2010 at an initial cost of Rs 2,800 crore. The state government has already made some progress under the scheme and received accolades in the country and abroad. One of the welfare wings of the Tata Trust, the North East Initiative Development Agency (NEIDA), will be involved in the joint collaboration with the Mizoram government. The venture aims to cover the entire state, which has a population of about 11 lakhs, in phases under the NULP programmes, the sources said. The NEIDA also has its footprints in other northeastern states like Nagaland and Arunachal Pradesh.